Bowel Cancer UK’s award-winning health promotion team is looking for work places and community groups across Northern Ireland to host a talk about bowel cancer, to raise awareness of the country’s second biggest cancer killer. The 30 minute talk is delivered by a trained health promotion volunteer, who often has a personal experience of bowel cancer. The programme, which was awarded a Health and Wellbeing Award by the Royal Society for Public Health, raises awareness of the disease and good bowel health, highlights the symptoms and risks, and stresses the importance of those who are of screening age to take the bowel cancer screening test when they receive it in the post. 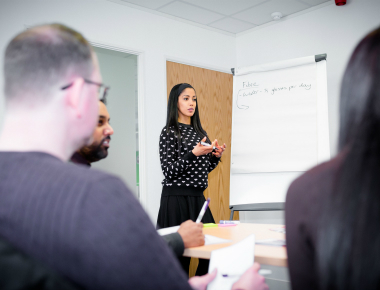 If you’re interested in hosting an awareness talk at your work place, community group and any other place that has an existing group or charity, visit our Book a Talk page or email niamh.mcdaid@bowelcanceruk.org.uk.